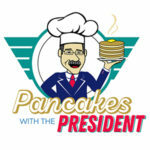 Students can gear up in preparation for finals at Pancakes with the President, scheduled for Tuesday, April 23, from 9 to 10:30 a.m. on Academic Walk near the Union. Attendees can enjoy a pancake breakfast, giveaways from Gormley, a photo booth and prizes. The first 50 students to arrive will receive a free souvenir T-shirt. For more information, contact freshmandev@duq.edu.